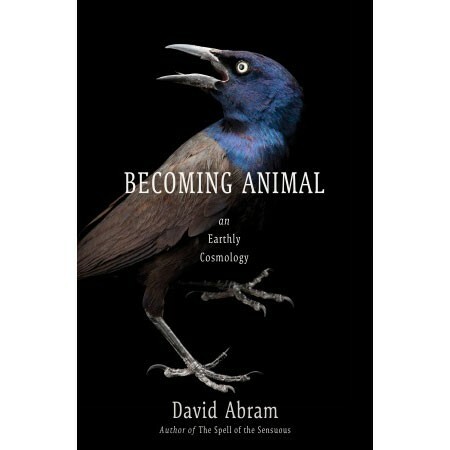 David Abram is a phenomenologist and ecologist who is interested in “the qualitative language of direct experience” (289). And since his 1996 book The Spell Of The Sensuous, he’s been on a mission to get his readers to tune/re-tune their animal senses “to the sensible terrain” (3) of earth in order to become more deeply connected with its powers. This “sensible terrain” includes the “more-than-human community of beings that surrounds and sustains the human hub-bub” (9)–you know: insects, animals, trees, rocks, dirt, air, flowing water, mountains, sun, clouds, wind, rain, and snow. In other words, Abram is asking us to pay close attention to nature wherever we might encounter it, to attune ourselves to all its non-human inhabitants, their moods, their rhythms, and their affect–as if we’re being spoken to. And he wants us to not only listen with our whole beings but also listen to ourselves listening. It’s an approach Abram associates with many indigenous communities, for whom “everything is animate, everything moves” (269). This kind of body-listening–being aware of our “animistic inclinations…underneath all our literate logics” (276)–is a step towards valuing the earth’s fragile (and ever threatened) ecology as well as a way of releasing in ourselves powers we never knew we had. Becoming Human: An Earthly Cosmology (2011) is a remarkable and passionate book whose power derives from how it “attends closely to the sensuous play of the world” (298). In fact, the book is largely about the experience of perception and its texture. Drawing inspiration from the phenomenological approaches of Edmund Husserl (1859-1938) and Maurice Merleau-Ponty (1908-1961), Abram grounds his writing in his ongoing, open-ended and always changing relationship with the world. As I suppose other writers do too, except that few of us take the time to capture our perceptions so vividly. The book is structured around a series of topics that Abram explores and unpacks, ranging widely from shadows and depth to the materiality of things, language, reciprocity, mood, mind, and magic. There’s so many engaging perceptions thrown at us in the course of these chapters that it’s difficult to know where to begin a summary. What follows, then, are some highlights. “I was thinking, yes, but in shifting shapes and rhythms and dimly colored vectors, thinking with my senses, feeling my way toward insights and understandings that had more the form of feelings blooming in my belly than of statements being spoken within my skull” (112). In the chapter “Moods”, Abram wants us to realize how deeply our moods or feeling states are embodied and triggered by the weather, exploring torpor, lucidity, stillness, wind and rain. Our moods are not internal things, he says, but rather “passions granted to us by the capricious terrain” (50). Neuroscientists would no doubt have a field day with Abram, vehemently disagreeing with his locating of mind outside the human brain. But Abram speaks from deep experience of directing his attention “toward the odd otherness of things–holding our thoughts open to the unexpected and sometimes unnerving shock of the real” (153). This is hilariously illustrated in Abram’s account of how he once used fear-induced singing to stun a large group of seals into curious submission. “The more studiously an apprentice magician watches the other creature from a stance of humility, learning to mimic its cries and to dance its various movements, the more thoroughly his nervous system is joined to another set of senses–thereby gaining a kind of stereoscopic access to the works, a keener perception of the biosphere’s manifold depth and dimensionally” (217). One of Abram’s teachers in Nepal, a man named Sonam, asks him to spend time focusing his visual attention on a rock, as if trying to get inside the rock’s presence. Next, Sonam adds listening to the mix, asking his student “to gather both of my listening ears into that small point in the air where my eyes were focused. What?!? (…) Sonam was simply asking me to concentrate my listening upon the very location where my two eyes were already focused” (242-243). After working with rocks, Abram is asked to focus on a raven perched at a distance–to look right at the raven just below its eyes for an extended period. Then the ante is upped again as Abram is asked to bring his tactile sense to bear on his attention exercises with ravens. Can he try feeling with his body what the bird is feeling? Where are these exercises going? Sonam wants his student to grasp a kind of ESP-like interspecies deep kinesthetic empathy. Abram’s break-through happens one day when he watches a raven struggle to move a rock and then feels this straining inside his own body. Remarkable! It’s through these kinds of perceptual exercises with Sonam that Abram realizes “the astonishing malleability of my animal senses” (251). Moreover, each sense is informed by the others and “as we explore the terrain around us, our separate senses flow together in ever-shifting ways” (ibid.). This sets the stage for a frankly awesome descriptive investigation of shapeshifting in which Abram describes witnessing Sinam metamorphose into a raven and then back again into human form. Abram eventually unpacks how this (probably) happened (237-241). Yet, even with this explanation, the links between the magician’s “kinetic invocations” (239) of the raven and their deep impact on Abram’s recalibrated senses are fascinating to ponder. And Abram, ever attuned to mysteries beyond his comprehension, leaves open the possibility that perhaps his teacher really did turn into a bird. The enduring truth about human perception, he says, “is that our bodies subtly bend themselves to every phenomena they experience (251). The question for all of us is: How far can we take our perceptual bending? As a musician and someone interested in the phenomenology of making and listening to music, I found much of interest in Becoming Animal. First, the book is a manual about human perception and how we experience the worlds we inhabit. Perception includes, of course, what we can touch, see, smell, and hear. Perception is “the sensory craft of listening” (289) with our bodies says Abram–listening to our environment closely, to one another, and to “the sonorous qualities of our voice and audible sound-spell of our speaking”(ibid.). As cliché as it may sound, Abram has helped me listen more closely–to the whooshing trees in my neighborhood and even the quiet hum of my computer’s hard drive. Once you read Abram a lot of things seem more alive. Second, as a manual about perception Becoming Animal is also a treatise on attuned, phenomenological writing. Page after page Abram models a wizardly ability to conjure the life force and energy of whatever it is he’s describing–whether it be a rock, a bird, a person, a feeling, the voluminous depth of a shadow, the stars or sky. This is very fine descriptive writing that reveals and resonates far beyond its subject matter to bring the reader deep into the insides of things and experiences that we didn’t know had an inside. Required reading, I would say, for aspiring ethnographers. “Reality shapeshifts. Underneath our definitions, prior to all our ready explanations, the world disclosed by our bodily senses is a breathing cosmos–tranced, animate, and trickster-struck” (298).